Welcome to iFastime Offical Website! And thanks for testing our Brand-new Video Tools! Hot News! The first-round iFastime Video Tools Promtion comes! Hurry up to join the 40% OFF promo activity at iFastime Facebook! The best seller iFastime Video Converter Ultimate for Win/Mac is offered with 40% OFF(Only $27.57 now) before Sep. 15, 2015 in reward for new customers' support and aiming to help every customers get rid of all Blu-ray, DVD, Video and Audio format restrictions when watching movies. 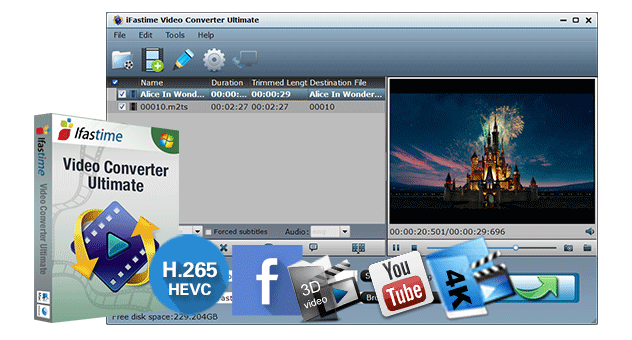 What iFastime Video Converter Ultimate can do? Wanna watching downloaded videos for viewing via TV in my touring caravan? Need to make e-copies of DVD collections or TV series you have on media server? Or prefer taking Blu-ray movies on your new Galaxy Note 5 when travelling? Sounds very convenient, right? Yeah, this is where iFastime Video Converter Ultimate comes in. (Only $27.57 now) It a strong and almighty tool to carry your points, and fully compatible with Windows 10/8.1/8/7/XP/Vista. With it, users are allowed to choose either format they wanna converting to accordingly. If the choose to convert to mobile devices, they can get every media files playable on Apple/Android/Windows devices by perfect movie conversion. If they want to encode your movies for playing in VR device, TV stations, TV receivers, DVD players without fuss, then it can Blu-ray/DVD movies and video files to popular video formats, such as H.265 MP4, M3U8, MOV, WMV, AVI, etc. for multiple usage as desired. If users choose to transcode to windows editors, they must make all your Disney, DreamWorks, Oscars, etc movies editable in non-linear editing software like Pinnacle Studio, Windows Movie Maker, Sony Vegas Pro, Avid Xpress Pro, Avid Media Composer, Adobe Premiere Pro, etc. 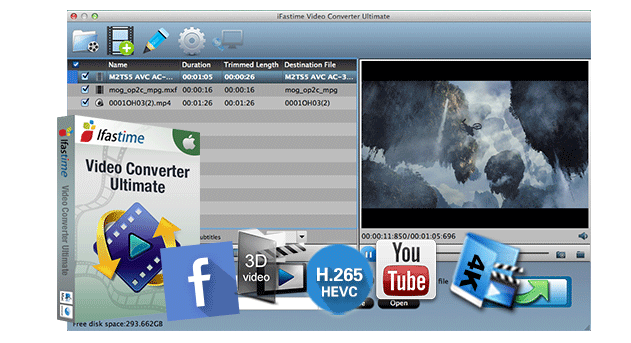 What iFastime Video Converter Ultimate for Mac can do? Video files comes with tons of formats, H.265, 4K, AVI, MOV, MKV, FLV, MTS, Tivo, VOB... While our video player, big screen TV, mobile devices, video sharing sites, video editing tool don't accept all of them. If you have shot video files from Hauppuage PVR, Canon, Sony. Samsung, Fujifilm, or download movies from social networking sites, like YouTube, Dailymotion, Facebook etc., how to get them to be played, edited and shared with ease? iFastime Video Converter Ultimate for Mac (Only $27.57 now) is a great video converter that allows you to change your videos into different formats on Mac OS X (El Capitan included), which will give you a great watching, editing and sharing experience with Apple TV, FCP, iMovie, etc.. Plus, it gives you so much more than just video transformation, but also Blu-ray/DVD conversion. The conversion process is very simple and requires no prior experience. It is lossless output quality. It is top-rated with its great stability, fast speed, main-stream devices/formats supported, lossless output quality and other extra features like built-in editor, 1:1 Blu-ray/DVD backup and 3D movie conversion. Two items are available with 40% off until the end of Sep. 15th, 2015. Time-limited. What are you waiting for? Action now! If you wanna more coupons, pls feel free to contact us>>. Should and Can I upgrade to iOS 9 and How to Upgrade? Which Video/Audio Formats Are Compatible With iPhone 7/SE/6S/6S Plus/6/6 Plus/5S/5C? What Are the Best Video Formats for Mac Computer?